As we moved into a new millennium, everything remotely digital, sustainable, connected and connective became “smart”. Today, Google has recorded two billion instances of the term. A lexical survey of today’s biggest smart themes and where they’re headed. In Neom, robots will one day outnumber people. Cars will drive themselves; drones will deliver the mail. The city will be powered by 100% renewable energy. And its residents will develop the technologies of tomorrow: transportation, biotechnology, IT, media. Saudi- Arabia is preparing for a post-oil future by building the world’s most advanced city for USD 500 billion on the Red Sea. Neom, the new Babel. The self-proclaimed “most ambitious project in the world” is intended to occupy a slice of land bordered by Jordan and Egypt and cover an area of staggering proportions: more than 10,000 square miles, or 33 times the size of New York. Sponsoring the project is Crown Prince Mohammad bin Salman, who has tapped Klaus Kleinfeld, the former CEO of Siemens, to run the grandiose venture. The first stage of construction is scheduled to be completed by 2025. These days, building a smart megacity from scratch is almost de rigueur for any self-respecting country, particularly in Asia and the Arab world: Masdar in Abu Dhabi, New Songdo City in South Korea, Nanhui New City in China. Smart city concepts have been springing up all over the world. Tech giant Alphabet’s Sidewalk Labs is planning its vision of a smart city in Toronto, Canada, with the Quayside neighborhood. Here, too, autonomous vehicles will zip through the streets as underground robots dispose of waste or deliver packages to residents. In Milan, Milano4You, a digital neighborhood being built from scratch for 3,000 people, will be based on two fundamental elements: free energy and extensive connectivity. Copenhagen and Vienna adopted smart city strategies long ago. However, in Germany and its European neighbors, the vision of a city that makes residents’ lives easier, safer and more energy-efficient is being largely pursued by cities, researchers and companies in standalone projects, initiatives and alliances. solution. In other words, the public IT system has to evolve in such a way that everyone can participate in it if they want to. “All the big corporations recognized smart cities as an important market a long time ago and have one or more smart city solutions in their portfolios. Many companies have migrated the smart city from their research unit to their business unit. It’s now part of their bread-and-butter business. And that’s one of the reasons why it needs open interfaces,” said Schieferdecker. Experts have recently begun to expand the debate beyond the smart city to also include the smart rural area – the use of smart technology outside cities. Prospects are dimmer in the countryside; fast Internet is nowhere to be found. That’s despite the fact that two-thirds of Germany’s population lives in semi-urban and sparsely populated regions. areas, particularly in Germany. For many years, these areas gave out large incentives to attract companies and grow the local economy. But without broadband Internet, the companies and young people will move away; the economy will stagnate. Internet access has risen higher on site selectors’ checklists. Moreover, smart solutions like driverless vehicles or innovative logistics schemes can often be trialed much more easily out in the country, where they not only drive innovation, but can counteract rural flight as well. of transport, but none more so than the automobile. Today, the automotive industry’s biggest trends are digitization, electrification and automated driving. The opportunities are enormous. And so is the pressure. vehicles have evolved from a unique selling proposition to an industry standard. But the real paradigm shift in the automotive industry is digitization. Accenture, a management consultancy, has estimated that digital automotive services could generate EUR 576 billion in revenue by 2030.
will in turn enable other new business models such as personalized navigation systems that tightly integrate the mobility very differently. Once driving is optional, the car will become a relaxing refuge – or a fully connected workstation. Productivity while driving is one of the most alluring promises for the future. Connectivity and automation are big innovation drivers in logistics, too. Around three-quarters of all goods shipments in Germany travel by road, with the volume projected to increase another 40 percent by 2030, according to the German Transport Ministry. There is plenty of slack in this system, though. Deadhead trips account for around one-third of all transportation, while loading and unloading requires long wait times. That’s why all major truck manufacturers are developing connected, automated vehicles that solve multiple cargo transportation problems in one fell swoop: driving times, safety, operating costs – and impending gridlock on the roads. entire supply chain, they can adapt and synchronize routes and logistics processes on the fl y. And that saves time and money and reduces CO2 emissions. struggle to manage its many side effects, including more traffic jams, delayed deliveries and a shortage of good locations for cargo handling. Luckily, these problems have solutions: drone deliveries, robot mail carriers and car trunk deliveries. physical resources such as cars, doors, cabinets or parcel drop boxes as well as logical resources such as workstations, systems or programs. One app can safely control these disparate access scenarios. Digital keys are cheap, allow realtime user identification and can be immediately invalidated if lost. As an added bonus, you can even collect personal bonus points with a mobile loyalty card if you want. currency. The project aims to compensate for fluctuations in solar power generation. However, the real runaway trend among private households is probably smart speakers and digital assistants. Market volumes and user numbers have mushroomed; experts are already forecasting USD 3.5 billion in revenue in 2021. Apple, Amazon and Microsoft are locked in a vicious battle for which digital assistant is the smartest: Siri, Alexa or Cortana. the prize that they stand to win? More data and knowledge about customers and consumers – and dominance of the artificial intelligence space. 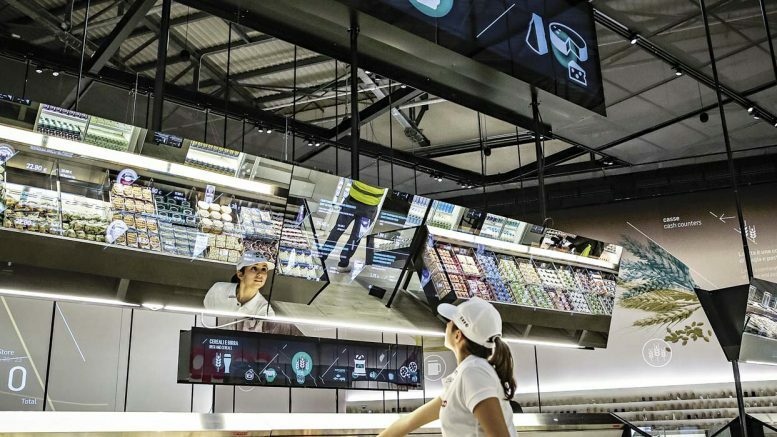 Planning, ordering and warehousing are already highly automated in retail. But as consumer tastes change and competition heats up, retailers have responded by upgrading their stores with advanced retail solutions. Plans for capital investment have set new records, particularly in retailing, according to a DIHK survey from autumn 2017. Today’s customers want a smart store that serves up a fully connected shopping experience. A place where real products are integrated in a digital world and where they receive highquality, personalized advice and assistance, all based on connected technologies and big data applications. To collect this data, cameras and sensors will monitor consumers’ shopping behavior ever more closely. As customers approach the store, devices mounted outdoors will track how many people come from which directions at which times; inside the store, equipment will track how visitors move through the store and what they’re interested in. Smart shopping carts might play a pivotal role in supermarkets and steer customers to relevant items, display recipes in the produce section, send out personalized coupons and eliminate the need to stand in line at the cash register. Smart shelves can autonomously place replenishment orders or assess the customer’s mood to provide better service. From Neom to Berlin to rural areas, our world is getting smarter every day. Soon, billions of things, people and infrastructures will be connected to one another, communicate with one another and interact with one another. According to a study by management consulting fi rm McKinsey, the Internet of things may generate up to USD 11 trillion dollars in value by 2025. That’s equal to about eleven percent of the world economy. Onward to the smart future!